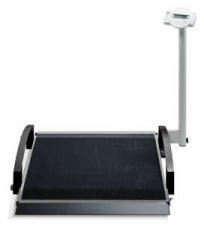 With its high capacity of 800 lbs, this scale makes it easy to weigh even heavy patients. Thanks to its extremely low platform and the self-lowering ramps, this scale is easy to access even if the patient is sitting in a wheelchair. Thanks to a flat ramp, the platform is easy to mount. The secure side rails give additional safety. An integrated pre-TARE function determines in seconds the net weight of the patient utilizing internal weight memory. The swivelling LCD display with large letters is easy to read both for the patient and for the carer. The seca 664 can be folded up in no time and can be transported anywhere thanks to its roller castors.